Amber Road Café breakfast is worth getting up for. Lunch warrants standing on line. Dinner? Amber's not open for dinner. Bummer. We find ourselves here for lunch and the only reason there's no line and we're seated is because we're late. Not far too late and not a moment too soon. 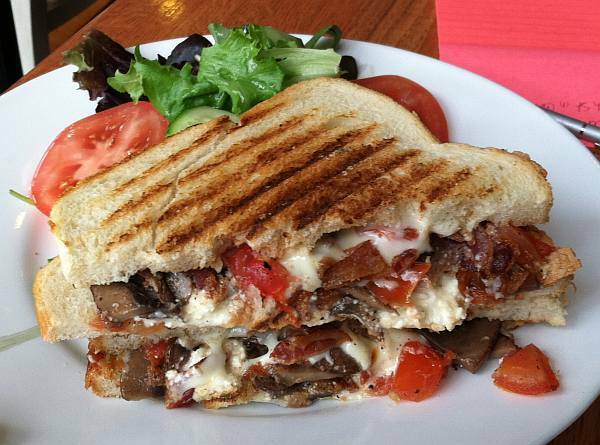 Here's a portabello panini with bacon, tomato and feta. I should have had those carmelized onions too. Will power = house salad, not fries. Mushrooms and tomatoes are full of summer. Panini smooshing's melted the mushrooms and cheese and won't I be sad when it's back to gruel tomorrow. 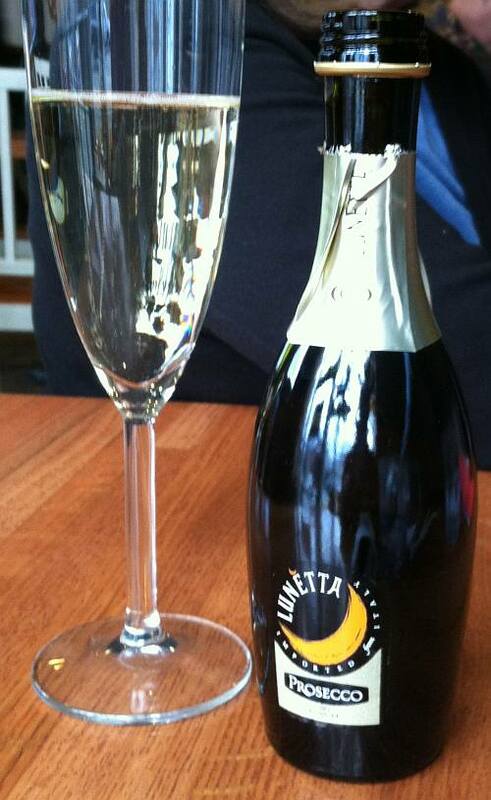 Lunetta Prosecco is bright and bubbled over with apple and peach. Don't know why, since it's routine, but today it is especially good so it must be the company. Amber Road writes: "We believe nature’s simple ingredients are enough." Owner Kristina Mikelenas stops to chat even though she doesn't know us. Well, we are the only ones taking pictures. We admire her black apron with a fine dusting of flour or maybe it's powdered sugar. Is today someone's birthday or the usual Sunday meal? Where's daughter Ruta? Because the whole staff's getting ready for lunch. We sneak a peek: there's the grilled eggplant, and the potato salad, pickles, rare prime rib, a pitcher of sangria and two bottles of red. 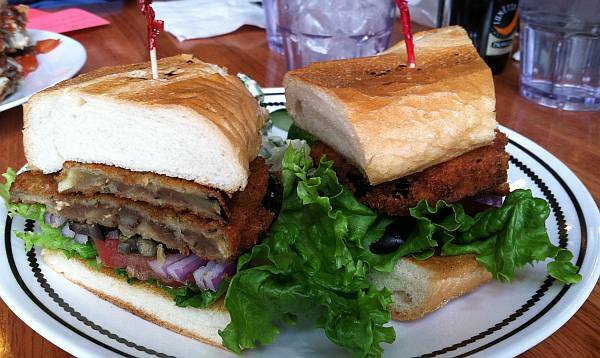 Okay, it was more than a peek owing to my nosiness and who doesn't want to know what the chef has for lunch? Ten are seated and here are two others serving and taking pictures. Kristina's petitioned the local selectmen to add tables in the parking lot. Will you ever reconsider, Canton selectmen, or do you want a petition? By yourself? Try the short bar with wine and six seats. Tables handle just 35 so come early or late. It's all over by three o'clock weekdays and at two Saturday and Sunday. The setting's cheery and quaint with service that's brisk. (I could do without the vacuuming.) On Urbanspoon, they're rated 100% and TripAdvisor's not too shabby either. Every so often, how about we upload a rack of new photos with links to those raves?